These exquisite antique earrings feature a frame of dazzling round cut diamonds. 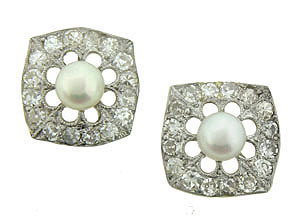 Circular cutwork surrounds a single luminous cultured pearl giving the earrings a floral appearance. The Art Deco earrings are set with approximately .60 carats of diamonds and finished with post backs. They measure 7/16" square. Circa: 1930.